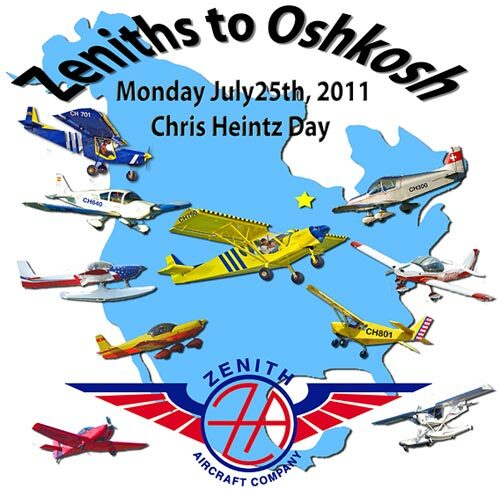 The Zenith Builder’s Banquet to honor Chris Heintz will be held on Wednesday, July 27th with cocktails starting at 6:30 and dinner following at 7:30. We have 155 people as of today that have pre-registered. Banquet tickets are still available. If you want to purchase your tickets by mail, please don’t send your money past Thursday, July 21. I can set your tickets aside to be picked up at the banquet “will call” table. It will be too late to mail your tickets after July 19th. Banquet tickets will also be available in the Zenith display booth up until Wednesday at noon or until they are sold out. The do not exceed number is 250. Tickets are $20 per person. The banquet tickets were made post card size and were designed to be a keepsake. When you check in, volunteers will punch your ticket, and you will be able to keep it as a memento. (You can get Chris to autograph it!) A brochure was also sent out with the tickets showing directions, parking, and bus schedules to Oshkosh and Gruenhagen Hall. The banquet will be held in the Nature Center building #2 located between the EAA grounds and the Museum in the EAA Nature Park. If you are attending the convention, it’s about a 20 min walk from the flightline. If you are traveling by car, head east on Waukau Ave just like you would be traveling to EAA parking. Tell the officer directing traffic you want to go Nature Center Parking. If that lot becomes full, the officer will direct you to the EAA parking on the south side of Waukau Ave. From there it’s a 5 min walk to the nature center. If you are coming from Gruenhagen Hall, the bus will drop you off near the control tower. From there, it’s about a 10 min walk to the Nature Center. Please come early. If we have the full 250 people reserved, you should plan on being there by 6:00 PM. There will be a group of us there by 4:00 PM if you want to volunteer your time. We have some great prizes to be given away including a beautiful headset from David Clark, an instrument flight course by Sporty’s, subscriptions to Contact Magazine, and lots of aviation gifts and gift certificates from Aircraft Spruce. Who is coming this year? Tom Poberezny and Paul Poberezny will be there to honor Chris. We have 3 people attending that are building a CH650 in Russia, and we have people from all over the world including South Africa, New Zealand, Australia, and China! Zenith builders Larry Zepp, Ken Pavlou, and Mack Kreizenbeck have volunteered to man the check in tables. William Wynne will be escorting Tom Poberezny and our own Sabrina will be escorting Paul Poberezny. As of today, we have 32 Zenith airplanes that have reserved a spot in Zenith Showplane parking! With the Zenith planes camping, and on display, that will bring the number up to over 50, so there is still a lot of room to bring your plane to Oshkosh! When flying your plane to Oshkosh, please make sure to follow the AirVenture NOTAM. The Parking volunteers recognize the plane type for most planes. To help them along, make a sign from a sheet of letter size paper on your computer that says “ZENITH SHOWPLANE”. Flash the sign after you flash the correct sign listed in the NOTAM. We have 4 rows of parking stalls reserved. Planes will be parked nose to tail. If you are participating in the Monday morning ceremony with Chris, park your airplane on the outside row to make it easy to remove your plane for the awards event. At EAA’s suggestion, EAA will set aside an aircraft camping area specifically for Zenith Aircraft. Once again, follow the NOTAM for taxi information, and make a secondary sign out of letter size paper with the words “ZENITH CAMPING” on the sign. Use the Papa-1 taxiway. The parking volunteer staff will direct you to the Zenith aircraft camping area, row 301 & 302 off the Papa-1 taxiway. EAA has set aside 20 Zenith aircraft camping spots. On Monday morning, this is the event where all Zenith builders and enthusiasts need to attend. Chris Heintz will receive a special commendation by Tom Poberezny, Chairman of the Board of EAA. One of many kinds of Zenith aircraft will be parked at ConocoPlaza, formerly AeroShell Plaza. Please be there by 9:30 to help coordinate and organize for pictures. The event will take place from 10:00 AM - 11:00 AM, with Tom coming at 10:30. Members of the press from all over the world will be interviewing the pilots of the Zenith airplanes during this time. The Review after the ceremony is still being worked out. If you are selected, I will keep in touch with you and let you know where the pre-flight briefing will be taking place. Russell Lepre’ from Flight Crafters has designed a great T-shirt and cap (see above) to commemorate our Zenith celebration at Oshkosh. You can order now and have your shirt and cap for the convention! Please go to www.flightcrafters.com for more information. Shirts and hats will also be available in the Zenith Aircraft booth. Flight Crafters will give a T-shirt away free to every Zenith builder that flies a Zenith to Oshkosh! A huge thank you to Russell who designed this year’s Zeniths to Oshkosh logo. You can pre-order you T-shirts and hat by calling 813-779-1156. (Visa and MasterCard accepted). Just last week, Gruenhagen opened up another 100 rooms for EAA. There is a great deal of new construction at the UWO. Most of the hotels are sold out. If you still need a room for Oshkosh, Call Gruenhagen Hall at 920-424-1103. The charge is $55 per room, and each room can hold 2 people. It’s not the lap of luxury, no mints on the pillows, but its only $55 per night! EAA member Rick Land builds custom guitars for the enthusiast and professional musician alike. Talented artists like Herman's Hermits and others strum these beauties. A special tribute guitar commemorating Zenith Aircraft has been designed and will be signed by Chris Heintz. This one-of-a-kind guitar can be yours! For more information on the guitar, please go to Auction website. Mon 7/25: 10:00 AM - 11:00 AM: Special Presentation at ConocoPhillips Plaza (Formerly known as AeroShell Square) with Chris Heintz and Tom Poberezny. Mon 7/25: 1:00 PM - 2:15 PM - Chris Heintz Design History: 40 years of light aircraft designs (Forum Pavilion 07 Mainstage). Mon 7/25: 4:00 PM - Chris Heintz will appear at the “Autograph Corner” located at the EAA “Wearhouse” near the control tower. Tue 7/26: 1:00 PM - 2:15 PM: Designing and Building a Modern Light Aircraft, by Chris Heintz (in the Homebuilders Hangar – “Homebuilts in Review”). Wed 7/27: 10:00 AM - 11:15 AM: Light Sport STOL Aircraft (Forum Pavilion 09). Wed 7/27: 2:30 PM - 3:45 PM: Zenair Floats for Light Aircraft (Forum Pavilion 03). Fri 7/29: 8:30 AM - Chris Heintz will appear at the “Autograph Corner” located at the EAA “Wearhouse” near the control tower. Fri 7/29: 11:30 AM - 12:45 PM: CH 650 Aircraft (Forum Pavilion 11). Fri 7/29: 1:00 PM - 2:15 PM: Sheet Metal Construction (Forum Pavilion 04). A huge thank you to everyone who has stepped forward to volunteer to make this celebration one to remember. I can still remember sitting in the meeting with Tom Poberezny and Adam Smith many months ago. I want everyone to know how incredibly easy it is to work with the professional staff of the EAA. Also, EAA waved the $2000 rental fee for the Nature Center, and volunteered to provide a digital projector and PA sound system at no charge for Chris. Everyone have a safe and pleasant trip to Oshkosh. This will be a convention to remember! If anyone has any questions, feel free to call me at 920-237-1450. Agora temos no Brasil um representante da Zenith que fala Português.. Thanks Jerry. If anyone needs a ride from Milwaukee, Madison, or Appleton to Oshkosh, I found a semi-retired guy that will pick you up from the airport for a small fee. E-mail me off list for more information. backstagelive@gmail.com. Anything to make a buck!!! and hoping that I can pay someone to take me up on one. If you can help i'll see you at the event. Thanks so much Ted. You know, when you do thing on the spur of the moment, it's more fun. Drop what you are doing and come to Oshkosh! I can hook you up with a room, get you a ride from the Milwaukee airport, anything you need! This will be one of the biggest years for Zenith at EAA. I was just on the EAA grounds today. There are a whole bunch of airplanes there now, and it's Tuesday! This will be an incredible convention! This is exciting, Joe. Congratulations! No way I can make it this year but I'm looking forward to getting there someday. You guys have a great time. It looks like there's already an early bid in (for $1,500!) Here's your chance to get a great one-of-a-kind custom guitar (of your favorite planes) while supporting a great cause! Hi Geoffrey, I will postt he final blog on Friday. Just follow the latest NOTAM and make a sign on 8 1/2 X 11 paper that says ZENITH SHOWPLANE and show it to the parker AFTER you show the correct sign in the notam. We were just informed by EAA that they would like to park all Zenith aircraft together in camping also this year. In that case, make a sign that says ZENITH CAMPING and show it to the parking staff after you show the correct sign as per the notam. EAA is bending over backwards to make this event extraordinary! Have a safe trip to Oshkosh and watch for a Friday blog. Looks like you are a very busy man and doing a great job, Joe. I have a parking place reserved in the Zenith parking area for my 640 but I am wondering what sign I put in my window to make sure the ground handlers direct me to the right place. Maybe I missed this info somewhere. Just got some huge news from Oshkosh EAA. Looks like EAA is setting aside a special camping area for Zenith aircraft camping! I will have some more information on where it will be in a few days.Banquet tickets went out in today's mail with everything you will need for Oshkosh including bus routes from EAA to Gruenhagen, banquet parking, etc. I will have a final update for everyone in about a week. You can still get banquet tickets by mail. Send $20 to Joe Scheibinger, 2809 Scenic Drive, Oshkosh, WI. There will be some available at the Zenith tent on Monday, but get their early. We are at 140 so far! Have a safe flight to Oshkosh! Hi Bill! Thanks for the post. A STOL landing competition would be a great addition to Oshkosh EAA. I can just picture a bunch of 701 /750's lined up on 36/18 in Oshkosh to land on te orange spot! This would have to be approved by the EAA. If enough STOL airplane owners would get together and co-sign a letter to EAA I'm sure they would get something started. I could picture this in the ultralight runway area! I think it would be a great crowd pleaser!